Happy Monday! Today is my first day of classes for my senior year- I can't even believe it! It's still crazy to me to think that I was still at home in Maine at this time last week. I am definitely excited for this semester to get rolling though- it will be busy but busy is good! On my last day of work at my summer job, both of my parents came to see me during my dinner break and treated me to dinner at a local pizza place! The treats then continued with a trip to Ben and Jerry's for my favorite item on their menu: the Cookie Cookie sundae. If you've never had one, you need to try one next time you're in a Ben and Jerry's Scoop Shop! There's a Ben and Jerry's within walking distance of the store I work at back home in Maine, and the first summer that I worked there that proved to be very dangerous for me (Cookie Cookie sundaes had become a weekly occurrence...). Please excuse the fact that neither of us are wearing make-up (both of us had long days before this photo was taken! ), but I'm so happy that I got to meet my blogging bestie Caroline from The Caro Diaries on my drive to school last week! She goes to college in Connecticut, which just so happens to be one of the many states that my dad and I drive through on the way back to NC. 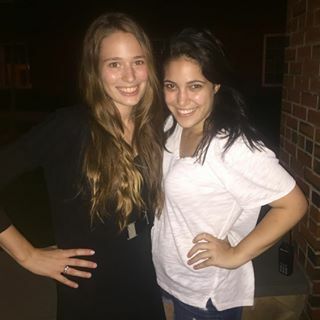 We planned a short rest stop at her college, and finally getting to meet her in person was such a delight! In case you didn't know, Caroline and I co-founded a blogging network together earlier this year called the Millennial Blogging Network! Check it out here! And as far as my shirt that I'm wearing here... while packing for school I re-discovered my oversized concert t-shirt from when I saw Selena Gomez in 2011 on her We Own the Night tour. What an amazing concert! I just love her so much and have no shame about it. This shirt definitely will be worn at school this year! My most favorite part of all of the drive South each year is when we cross back into my favorite state! 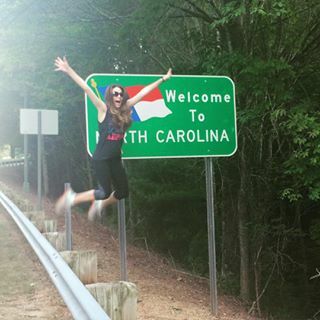 Last year I did a jumping picture with the state sign (at the Virginia/North Carolina rest-stop), and this year I was determined to jump even higher. I think I made my goal! Some of you might recognize Caroline, who is one of my best friends from school! 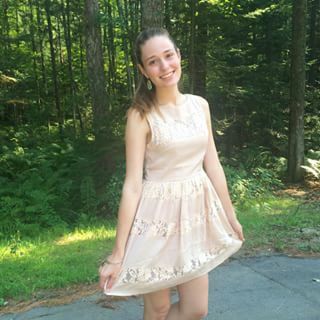 I've featured her in some of my outfit posts before (since she has a lovely sense of style! ), and she was also in my Who Takes My Blog Photos? post. 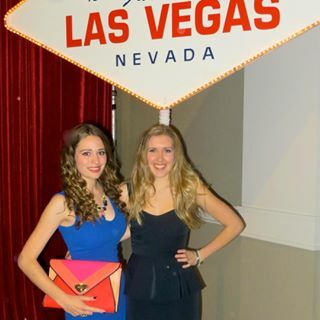 It was Caroline's 21st birthday last week, so I thought it would be appropriate to Instagram a photo of us from when we attended a semi-formal at school last year that was Vegas themed. If we can't actually be in Sin City on our 21sts, why not pretend right?! My birthday is coming up next week, so I can't wait to celebrate together! A casual outfit that I wore for my first day back in Charlotte this weekend! I'm obsessed with these sunglasses- only $10 from TJ Maxx! Hope that y'all are having a great start to your week! Stay tuned for many more posts this week and next! My oh my does it feel good to be blogging again from home sweet NORTH CAROLINA! I am finally back in the South again, after a few days of road tripping with my dad. In past years, I have taken at minimum five days off from work before the trip to fully pack, say good-bye to friends and family, and also pre-schedule blog posts for while I'm on the road! This year though I was only able to take two days off of work before leaving (since I took a full month off earlier in the summer to study abroad in France! ), so everything was much more rushed and condensed, and that didn't leave me a lot of time to prep my blog! But the drive went safely and very well, and it is oh so good to be back! I move into college for my senior year tomorrow- which I still cannot believe. College is really starting to fly by! I guess the whole point of this post was just to let you all know where I have been this week, and to share some ideas for blog content for the month of September! September is going to be a crazy month for me, between resuming my internship and babysitting jobs, having a full class schedule of upper-level major classes, and also having sorority recruitment practices everyday for the whole month! 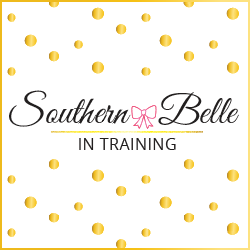 But blogging always helps me to manage and balance out my busy schedule, so I'm excited for what's to come here on SBIT next month. I will be traveling to Myrtle Beach next weekend with two of my best friends from school to celebrate my 21st birthday! I have only been to Myrtle Beach once before (as a day trip... read about it in this old blog post! ), so I am getting so excited to spend a full weekend there! I know it's the perfect type of town to turn 21 in. If you have been to Myrtle before and have any restaurant, shopping, or attraction recommendations, please send them my way!! I plan to recap both my outfits from the trip and also share a recap of how we enjoyed Myrtle Beach and our favorite things that we did! Some lifestyle posts that I'm planning for next month are to do a recap post of my road-trip route to and from Charlotte to Maine (it's a drive that I've done several times with my dad now, and I'm excited to write more about some of the places that we look forward to stopping at each time!). I am also hoping to finally start filming some hair tutorials for the blog this Fall! This is something that I have been wanting to do for a long time, but my hair has finally grown out to a length that I really like, and I have some friends at school in my department that are better at video editing than I am. ;-) And of course on the fashion front, I can't wait to start transitioning my wardrobe into cooler weather outfits!! It will still be warm in Charlotte for awhile so it will be a slower transition, but it will come. I'm so excited to start shooting outfit posts at all of my favorite Charlotte locations again! And last but not least, stay tuned soon for what is my favorite blog photoshoot of all-time! I met up with the talented Emily of Emily Sacra photography when we were driving through Virginia this week, and she did the most amazing shoot with me to celebrate my 21st birthday/3rd blogiversary. 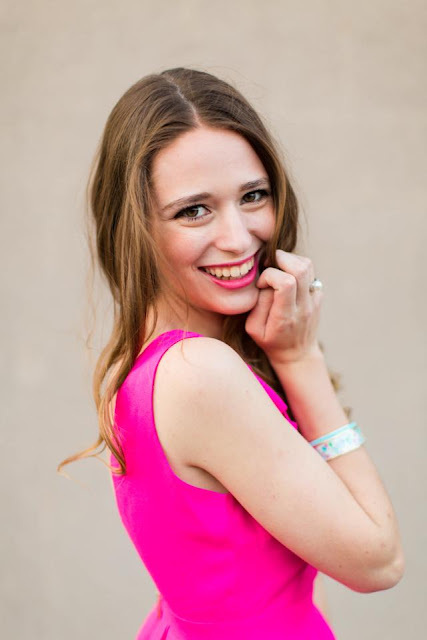 The picture above is a little preview... but I promise there is so much more to come! Talk to y'all next week! And lastly, I want to be sure to talk about my tassel earrings! I'm obsessed! Tassels are so on-trend right now, and I've been looking for a great pair all summer. I did fall in love with some slightly pricier pairs online, but before I made the splurge, I decided to stop by my favorite hometown jewelry boutique before one of my shifts at work last week. I'm so glad I did, because these gorgeous earrings were only $3!! Yes, $3! Sadly my favorite jewelry store here in Maine doesn't have an online marketplace so I can't link them, but I do want to encourage y'all to shop local when you have the chance! I love my favorite mall stores and national brands just as much as the next gal, but it's great to be able to shop locally in your community sometimes, especially when the deals are that amazing! Hope everyone has a great Monday and start to their week! Today is my last full-day for a long time here at home in Maine... tomorrow the road trip to Charlotte with my dad begins! There will be lots of fun stops and surprises along the way, so be sure you're following me on social media for road trip updates! @miss_alk on Instagram and Snapchat and @rainbowflash94 on Twitter. France Study Abroad Trip: Afternoon in Italy. 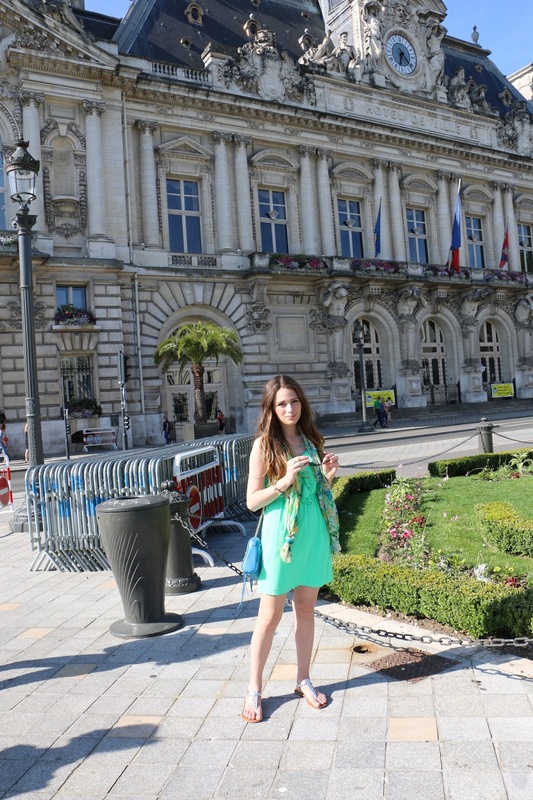 Time now to share the last post recapping my study abroad trip from June/July of this summer to France! This post is the one that I have been most excited to write, so I decided to save it for the very end. After I switched language schools while abroad (from Central France to the South of France), I was excited to see that my new school had a lot more options for day trips and excursions! 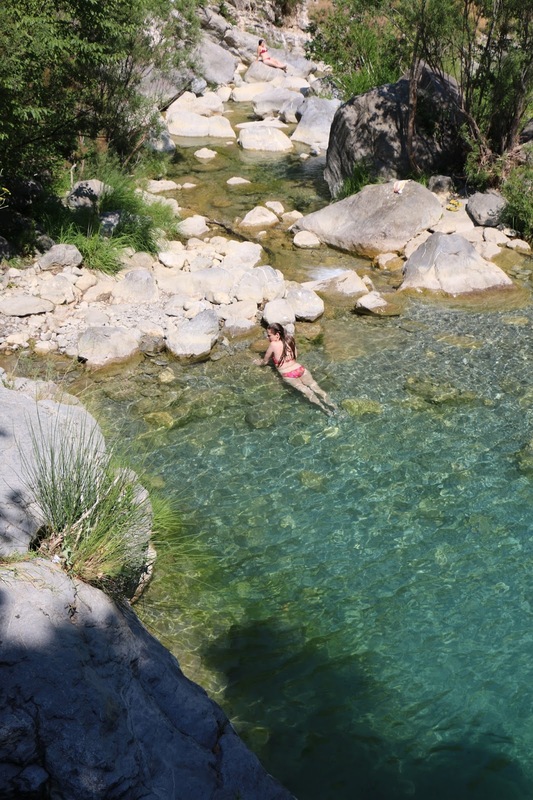 One trip that was being offered that caught my eye almost immediately was spending an afternoon hiking to see a waterfall in the mountains in Northern Italy (only about an hour away from Nice). Although I am absolutely a city girl, I do really enjoy hiking and spending time in nature, especially when that has to do with waterfalls! By this point in my time in France, some of the difficulties that I experienced while studying abroad were really starting to intensify, so I thought that this day trip might be the perfect little getaway from everything that I was experiencing. The drive from Nice into Italy was absolutely incredible. The European highway which goes along this part of the Mediterranean, the A8, had absolutely the most breathtaking views that I have ever seen on a highway in my life. Mountains, cliffs overlooking the ocean, small Mediterranean villages... absolutely incredible! The drive itself was almost my favorite part of the whole afternoon! Something else that I found interesting was that when crossing by land, people don't need to bring passports to go into other European countries, thanks to the EU's Open Border system. Driving from France to Italy was about as simple as when I drive to South Carolina for cheaper gas when I'm at school in Charlotte! This whole system was especially strange to me because I have visited Canada several times by car (being from Maine), and doing land-border crossings from the US to Canada are a very different situation. It's never happened to my family, but it's not unusual for border crossing patrol to stop and do full inspections on vehicles! I sadly cannot remember the name of the waterfall that I visited! 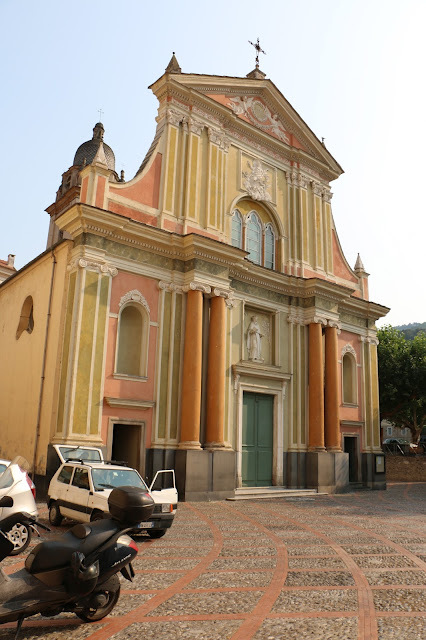 It was a little bit past the small village of Dolceaqua, Italy, which is fairly close to the French/Italian border. You have to drive down some small-ish roads a little bit past the center of the village to a big parking lot, and then you do a short hike through a trail in the woods before hitting the waterfall. The area seemed very popular with locals as well as tourists! I had already started feeling sick by the date of this excursion, but I'm still so glad that I followed through and went on it. This day trip was absolutely my favorite thing that I did during the whole time that I was in France (although ironically this was in Italy ;-) ). 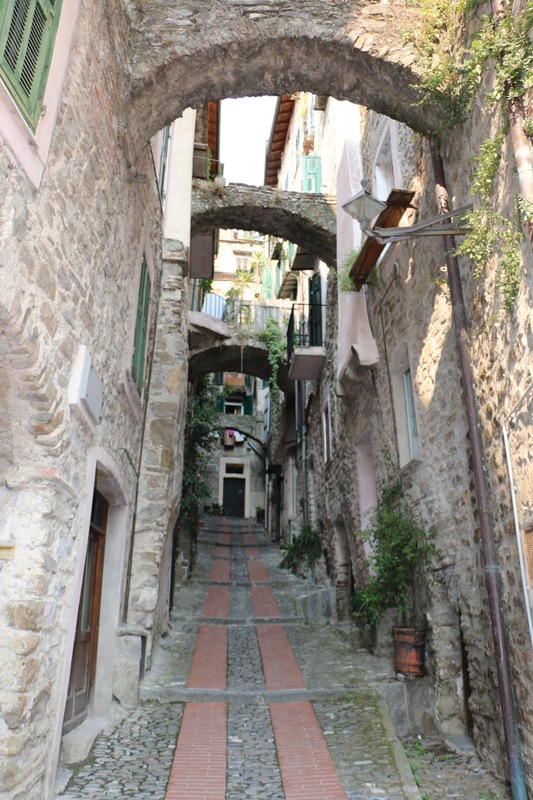 After visiting the waterfall, the tour guide took us to visit the small village of Dolceaqua, Italy. We only got to explore and walk around for maybe 20 minutes or so before having to head back to France, but I'm still so happy that we stopped! Even though this part of Italy was only about an hour away from Nice, to me it really did feel like a completely different country. I only got to spend one afternoon in Italy, but I certainly wish I could have been there longer! Definitely a country that I hope to return to and see more of someday. Thank-you to all of you who followed along with reading about my study abroad adventures both during and after my travels this summer! It definitely was an experience. If you will be studying abroad or traveling in France/Monaco/Northern Italy anytime soon and want to ask me more about my trip in detail, you can always e-mail me at rainbowflash94@yahoo.com! In other news, today is a big day for me! It's my last day ever of working at my summer job. I've worked at the same little store here in Maine for the past three summers! I will probably not be returning to live at home next summer, so it's a little bittersweet to be leaving my job. But the good news is that I'll be back in Charlotte in less than a week now- SO EXCITED! Time again for my new favorite weekly series! So glad that y'all seem to be enjoying these posts- I love writing them! About that new Macbook: As I mentioned in last week's Midweek Ramblings + Recent Purchases post, my 21st birthday gift from my parents came a little early, and in the form of a new Macbook! But here's the catch, I have yet to even touch that brand new computer since I brought it home a week ago! After bringing it home, it kind of hit me how much is on my old laptop- pretty much my whole life! I've had it since high school... and I spent a good deal of time online! Nothing has been transferred to the new one yet, and honestly that just seems like a lot of work to me during a week when I'm finishing up my job and starting to pack for school. So I think it will continue to sit in the box for a few more days (as my old computer continues to be slow and freeze on me, ha!). No make-up: In the photo above that I shared from my Instagram account, I am 100% make-up free! Y'all know that I'm a huge make-up lover. I can spend easily a couple hours everyday on my hair and make-up if I let myself! But over the past few weeks, I've found myself each day wearing less and less make-up (and not heat treating my hair so often). Finally today I just went make-up free to work. Make-up is a wonderful thing, but it's also so important to remember to be confident and feel pretty in your own skin! I also think it's good that I'm letting my skin breath a little now before heading back to school school soon. Not super exciting for my bank account but I got my textbooks for the upcoming semester last weekend! If the textbooks that I need are available for rent, I always rent them. This year I rented most of them through Chegg and then bought a couple on Amazon. My favorite purchase of the week was finally finding the perfect wine glass to take with me on my upcoming beach trip for my 21st birthday! 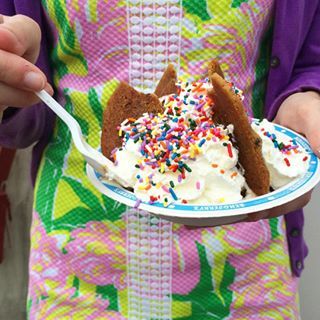 Hint hint: it's Lilly Pulitzer! (I didn't shop Lilly's After Party Sale this past week since I just bought textbooks and had some other expenses, so this was like my little tribute Lilly purchase!) See which adorable glass I bought here! 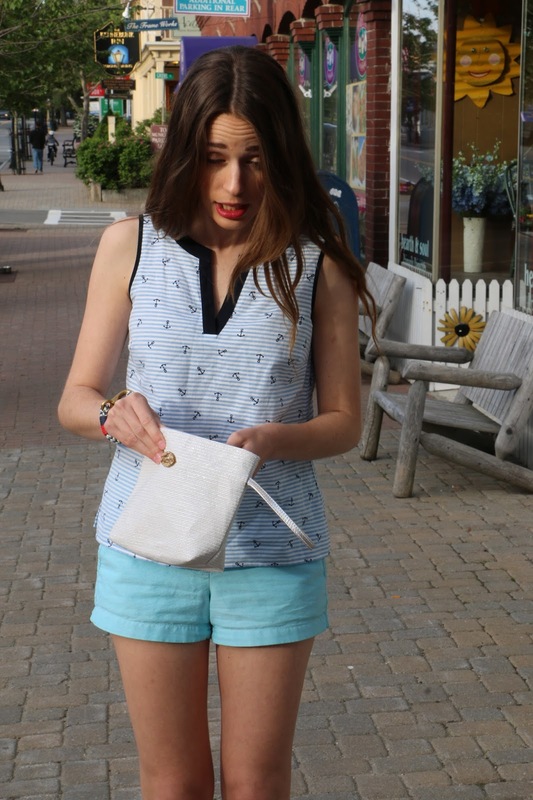 Best in Blog Photo Bloopers: Summer 2015. Anyways, it dawned on my recently that it's been quite some time since I've done a Blogger Photos Bloopers post! I try and do once about once a season (here's the last one I did!). As much work as there is that goes into fashion blogging, not every picture is obviously perfect, and I always think it's fun to share some of the funnier outtake pictures. Here are my favorite blooper moments from this past summer in blogging! Hope that y'all enjoyed! Already kind of bracing myself for how badly I know the Fall blogger bloopers will be- haha. My blog might have fewer posts than normal this week, as this is my last week at my summer job (40 hours of retail coming up! ), and it's also starting to be crunch time for packing for Charlotte! My dad and I leave for our annual road trip on August 25th. I usually do blog a lot while on the road though, so everything should be back to normal next week! Floral is definitely a big part of my signature style. 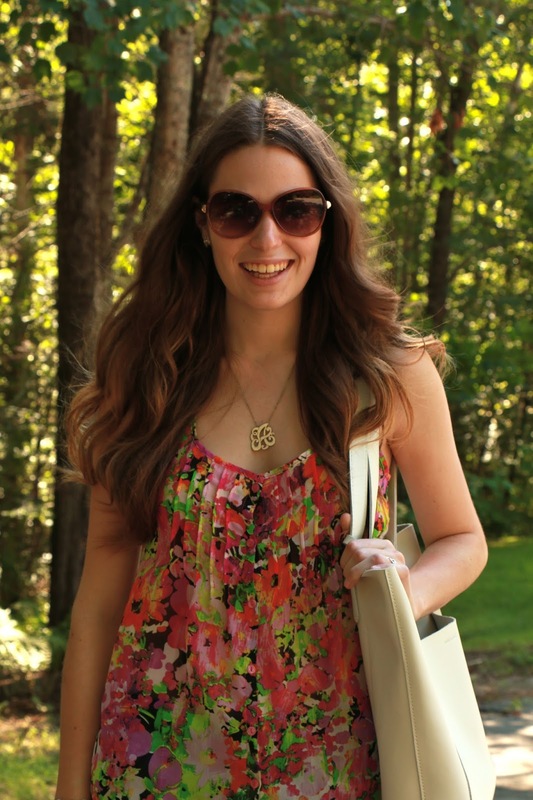 I'm pretty much obsessed with flowers, so I love wearing floral prints at all times of the year! The warmer months are definitely my favorite time to break out the florals though. 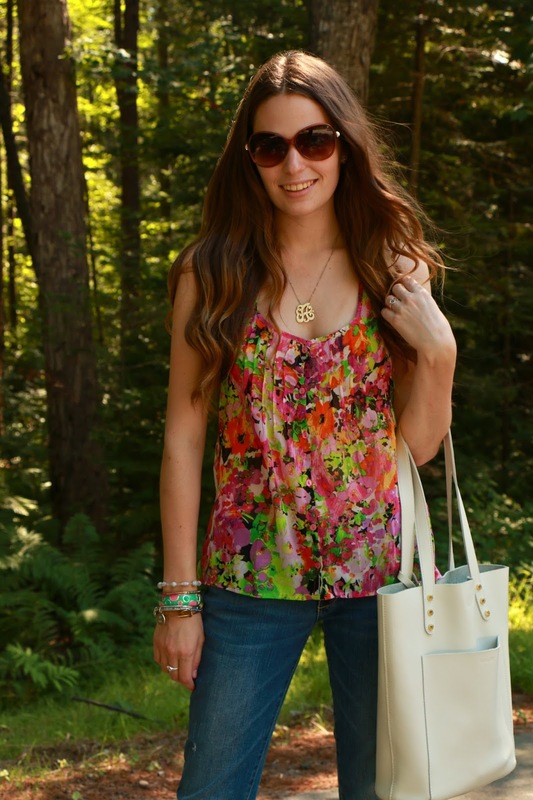 With the late summer heat starting to hit New England, this light-weight floral tank made for a perfect casual Friday afternoon outfit for running errands and visiting with my grandma! I have paired these "boyfriend" jeans with my favorite chunky brown heels before! (See this post.) Fun fact about these jeans that I love so much: they aren't actually boyfriend jeans! My secret to getting this perfect relaxed yet still figure enhancing fit is to actually buy a pair of American Eagle Outfitters skinny jeans, but to buy them a size or two larger than my normal size!! They will be the perfect combination of skinny yet baggy, and that's exactly how I like my boyfriend style jeans to look. As long as I wear a belt they stay on perfectly! Similar items are linked for y'all below! Hope that everyone has a wonderful start to their weekends! I am working today and tomorrow (and trying to start packing for school in between then), but I'm already excited for Sunday- my next day off! Lake Day: As pictured above, I spent a day this past weekend at a lake! Even though I grew up near the ocean in Maine, I've always had a soft spot in my heart for lakes. 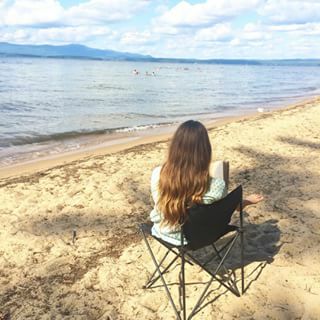 For the past several years, my parents and I have really enjoyed making day trips to a state park beach called Ellacoya State Park on New Hampshire's largest lake, Lake Winnipesaukee (Yes- that's really how it's spelled!). This state park beach boasts warm lake water, a sandy beach and beautiful mountain views! I wasn't able to make any trips to Lake Winnipesaukee last summer due to my work schedule, and I didn't think that I was going to be able to this year either. But I'm so happy that my parents and I were able to pull off a day! I didn't spend too much time in the water this year, but instead spent most of the day as pictured in the photo above. 100 Year Old Book: During my afternoon at the lake, I got to do something that I haven't done in far too long- I read a full novel in one sitting! Goodness did that feel good- I love reading for fun but it's something that I rarely have time for anymore between school, work and my blog! Here was the catch about the book that I read though- it was an original copy book published in 1915! I found it at a used bookstore that specialized in antique books during my trip to the Cape Ann region of Massachusetts back in May. It was such an interesting read- the main character of the book was a girl who was my age. Such a funny story though, the book started at the girl's birthday party, then she got kidnapped in her sleep (and survived! ), and then the book ended with her caught in a situation with two of her guy friends both being in love with her and she couldn't make up her mind as to who she liked. And the book left you hanging!! Definitely a fun blast from the past. 21st BIRTHDAY BEACH TRIP: Caps lock necessary for this item on the Ramblings agenda! Earlier this week, I booked my first ever vacation on my own! Due to the late hour at which I am writing this post, that's all that I'll say for now, but I can't wait to share much more about the trip soon- it's less than a month away! Lots and lots of these for my dorm room!! So exciting I know! But honestly- you need to buy 'em before they sell out and the other masses of college kids invade the local Targets and Wal-Marts! Since I splurged on a gorgeous new bag for my school books for senior year while in France... I decided that of course I needed to splurge on a fancy schmancy pencil case to go with it! I'm trying to go with a gold and/or sparkly theme for my school accessories this year, so of course I turned to Kate Spade for my fancy schmancy pencil case needs. This is the one that I ordered, and it arrived yesterday! This adorable graphic t-shirt! I first saw this when blogger Amanda from The Happy Arkansan posted a picture of it on Facebook, and I was literally like "OMG. NEED. NOW." and had ordered it within the end of the night- ha! So thank-you for sharing Amanda! The best part is that it's on super sale right now- even with shipping charges it was under $15! 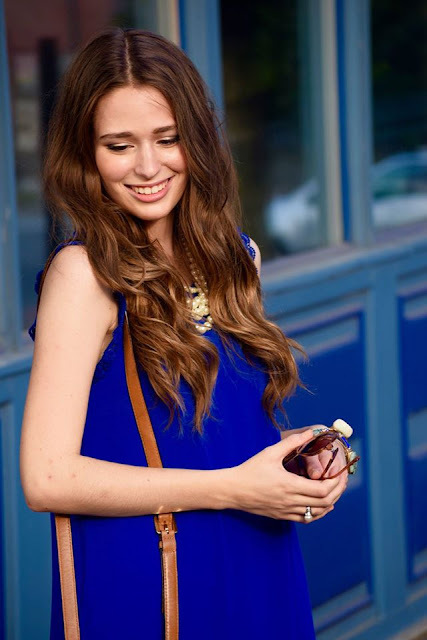 If you haven't noticed from some of my recent outfit posts, I'm totally crushing on royal blue dresses right now! I first had to buy one this summer for my sorority's upcoming Fall Formal Recruitment (styled here in yesterday's post! 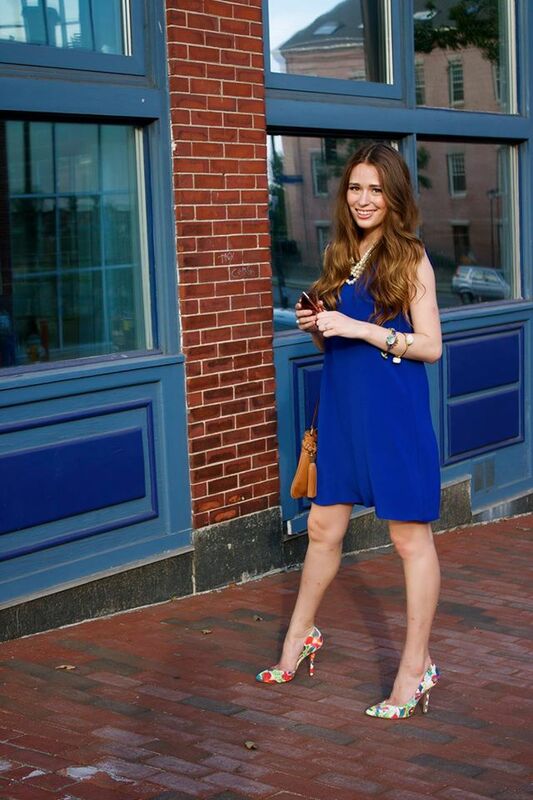 ), and then I also recently got to style this beautiful blue dress from custom dress retailer eShakti. 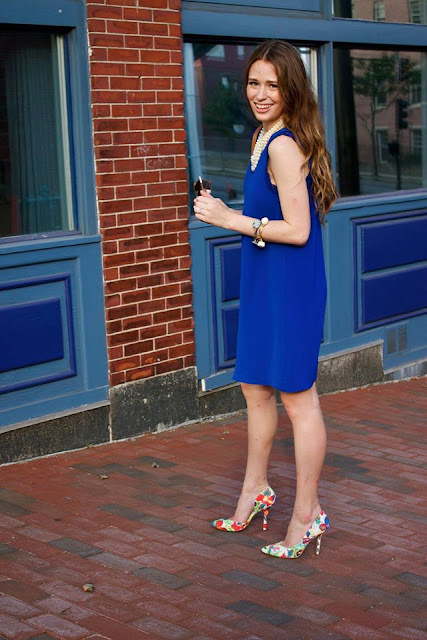 It wasn't hard for me to find a royal blue dress for recruitment at all- this color is currently everywhere to be found, and in so many fun styles and silhouettes! I've rounded up some of my favorites above (including several from Lulu's- a great online retailer for fun trendy dresses!). 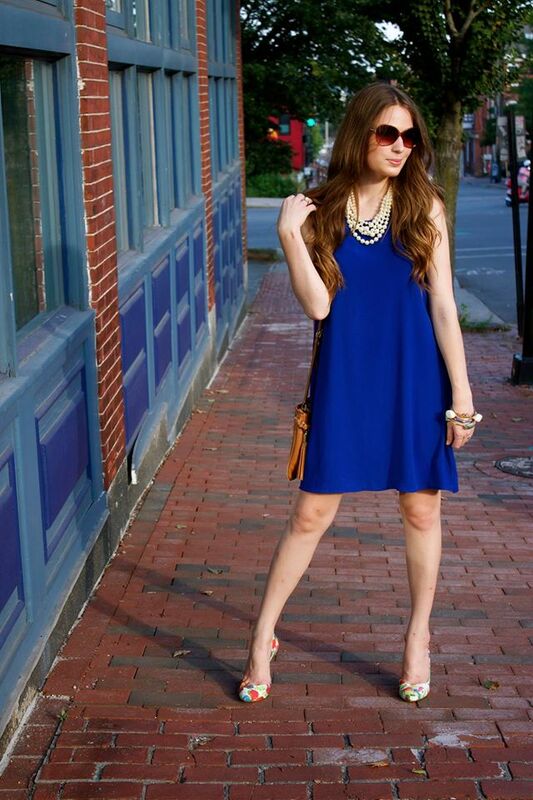 I think that a royal blue dress is an untraditional yet perfect fall transition clothing item. A lot of us will soon be jumping full force into fall fashion- which means lots of darker colors, denim, plaids, and generally a cooler feel to our wardrobes! While fall fashion is wonderful in its own right, I know that since my favorite fashion picks tend to be bright and colorful, I can very quickly grow tired of wearing fall colors day in and day out for many months. So I could totally see myself wearing one of these royal blue dresses in the cooler months- perhaps pairing one with tights and riding boots and topping it off with a leather jacket and scarf. Or maybe styling one of the more dressier dresses with some dark pumps and accessories with a pretty coat for a nighttime fall look. So many possibilities with this color for all seasons! What are your thoughts about dresses in this bold shade of blue? I'm Blue (Da Ba Dee Da Ba Daa). 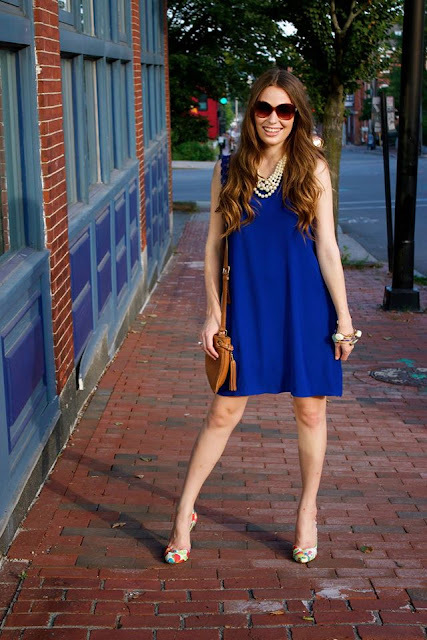 This simple short-sleeved shift dress is from one of my favorite online retailers, The Red Dress Boutique. They're a great go-to for on-trend items, and their sales and clearance section of the website can be truly on point! If I'm ever near their store location in Georgia, I know I'll have to pay them a visit. I love simple solid colored dresses like this one because they can be worn so many ways! I had to buy a dress in this color as one of my dresses for the ADPi side of sorority recruitment this year, but of course I couldn't wait to figure out other styling options. I knew that it would be the perfect chance to break out my new Jessica Simpson floral pumps that I had been dying to wear! I bought them right before my trip to France, but they had sadly been sitting in their shoe box in my room for most of the summer. These are such fun statement shoes, and I think that every girl needs a few pairs of fun statement heels in her closet! Lastly, who now has the song I'm Blue stuck in their head thanks to my post title?! ;-) I thought of the title for this blog post at work a few nights ago when it got pretty slow during a break between customers. Immediately after thinking of it, I scolded myself for not deciding to start naming blog posts after early 2000s songs like three years ago... which by the way is when I started this blog! My third blogiversary is in just a few weeks now- crazy! You're welcome in advance for the video below- and some similar outfit pieces are linked further down! My Dress Dilemma + $5 for YOU! Farewell, Southern Belle in the 'Bunk!